Vinyl Digital Exclusive. Limited Edition of 300 Copies! 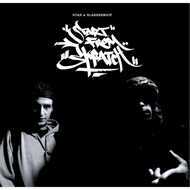 "Start From Skratch" is the next highly anticipated Release from the dutch Het Verzet / Da Shogunz Collective. The both protagonists "BlabberMouf" & Ntan" are mixing up classic Boom Bap styles with fresh Raggamuffin influences. Like Mad Lion in combination with the D&D Allstars (KRS-One, Jeru The Damaja, Fat Joe, Smif N Wessun Doug E. Fresh) back in the 90s, this combination enriches the real Boom Bap trademark sound of both flow prodigies!